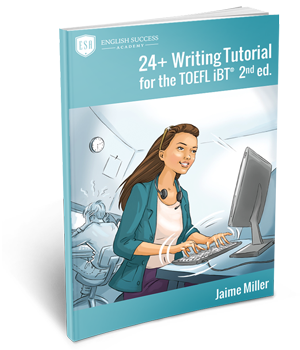 Write essays that TOEFL iBT graders will give scores of 24+. Write essays that TOEFL iBT graders will give scores of 24+. Have confidence — even when you don’t know what to write. You will understand the 5 “myths” that most students (and even some English teachers!) believe about the integrated and independent essays. You can analyze 9 models essays from students who got TOEFL iBT writing scores of 27 and 29. This allows you to see what kinds of mistakes are acceptable for different levels of scores. You can easily identify which types of activities you need to complete with our unique table of contents. You will stay focused by using the “Fail-Proof Daily Writing Study Plan” on page 1 of the workbook. … who got TOEFL writing scores of 24 or higher before, and who need to understand what to keep doing (and what to stop doing) in order to same score again. … who have only received scores of 18-23 before, and who need to understand what grammar, vocabulary and skills to study in order to get a higher TOEFL writing score. Follow the “Fail-Proof Daily Study Plan” in the downloadable workbook. Watch videos or review activities from the workbook. Write TOEFL-style essays every day for 4-6 weeks. – We recommend you spend 45 to 90 minutes a day for 4-6 weeks to experience measurable change, even under stressful exam conditions. “Before I started to study with Jaime I hated independent essays and all the topics. On my first test, I scored 22 in writing. Then I found Jaime. I wasn’t sure that she could help me increase my score because my first teacher was highly qualified and prepared a lot of students for TOEFL. But I decided to try.